In AnimSchool's Advanced Modeling class, Instructor Marty Havran shows how to easily sculpt hair in ZBrush. AnimSchool would like to introduce Animation Program student, Camilo Guaman. Camilo, can you tell us a little about yourself and how much animation experience you've had before AnimSchool? Well, I studied Graphic design and after I graduated, I started a small web design company with some friends. For 4 years we were doing great. We became a great influence in the country. But, at the same time, I was always a fan of the big websites that use 3D content in their work. So, I decided I would like to learn 3D to apply it in my web designs. In June 2008 I had the opportunity to go to the VFS School in Canada. I took their 6 month program where I learn how to model, rig and animate, that was a real challenge for me because I hadn’t done any animation, used Maya or any other 3D software before. As a result of the program, I did a short film called ” Heaven” and I had my first honor, I won the Renderman Teapot prize for best short film rendered with Renderman in the class 21. After the program, I really wanted to stay in Canada and find a job but my visa didn't allow me to do that, so I went back to my country to find a job. By that time, I had decided that I didn’t want to go back to web design. After searching for few month I got a job in Mexico, in a digital agency called Grupo W as a 3D artist. I worked there for almost a year and a half, but I wasn’t happy enough because I spent all that time modeling, rigging and animating hard surface stuff (cars, props, etc) nothing with character animation. At the same time the company was having financial problems too, so I decide to come back to my country where I found a job as a 3D animation instructor at a Graphic design Institute. I realized that in order to be competitive in the field, I needed to learn more animation. I started learning by myself, reading articles, and doing online tutorials, but soon I realized the necessity of a mentor, so I started searching for schools and I was really impressed with the AnimSchool characters and how the animation style was so appealing!!! 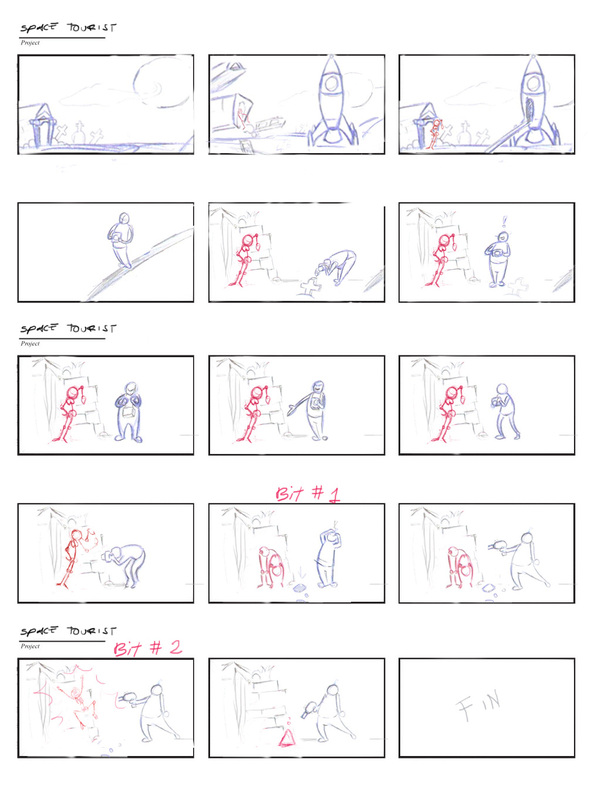 Camilo's Thumbnails for "Space Tourist"
I've always loved animated films, video games and cartoons, but I never realized that I could work on them someday. I remember being at the cinema watching Shrek 2 and saying to myself: “it would be nice to work on a 3D film.” It wasn't about the Shrek movie, it was more about doing something that many people can enjoy. To be honest, I've been asking myself this question over and over and I think here at AnimSchool I finally realize, the beauty of animation. I think what inspires me and what I enjoy the most about animation is the endless possibility you have to play with so many ideas, transition between key poses and personalities that you can try and experiment with. Looking back at past 3D films, what character would you have loved to animate, why? I've never thought about this before. I have many favorite movies but I always like the characters from Toy Story and Monster Inc, so if I had the chance I would love to animate Mike Wazowski. He has lots of energy, one eye, and is small in size, so it would be nice to play with that. 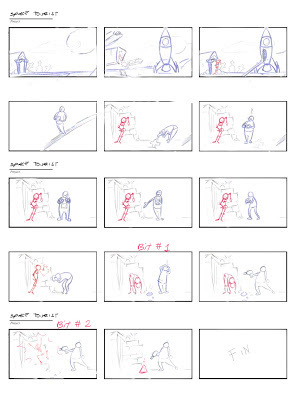 Student- Camilo Guaman - Class 4 Body Acting from AnimSchool on Vimeo. You not only attend your scheduled classes, but we also consistently see you in AnimSchool's General Review critique sessions, some have even been featured on the blog. Can you tell us a little about your experience with this optional class and what motivates you to go every week? This all has to do with a decision I made almost a year ago, I realized that this was my chance, this was my last opportunity to study with professionals animators from the industry, so with the support of my wife, I had to almost quit my job and work only part time, sometimes rejecting jobs offers, freelance work, etc. As a result my financial situation has been really hard, but my goal was to devote most of my time to school, with the hope that this can bring me someday to my dream job. Since General Reviews started, I've tried to be there as much as possible. For me it was like a class time. I remember for my class 4 assignment “Space Tourist,” Tony Bonilla was my instructor, and he was at General Reviews too. So, I showed my work in my critic time, then showed my fixes in General Reviews too. It was almost like a was having extra classes. One thing that really motivates me is having fresh eyes on my work, pushing some ideas and meeting new people from the industry, while having them take a look at my work and give me some notes at same time. Isn’t that amazing to have your shot constantly improving? I can definitely say that for me, the most successful assignments, are the ones I have been bringing to General Reviews, giving me more notes to address. Student Camilo Guaman - Class 5 Character Performance from AnimSchool on Vimeo. With every AnimSchool tests comes new challenges. Out of all the tests you've completed, which one has been the most challenging and why? You are completely right, with every new test comes new challenges. Definitely the most challenging and the one that I struggled the most with was my Character Performance shot “Drinking.” I think because it was the first real acting exercise that I did. Even at VFS we didn't cover this in depth because of the short program, so this was an extremely challenging test. You can ask Tony how much I struggled with the assignment :S …. I think one of the most difficult things was animating the face. Lots of new concepts there, and the jump between a “low res rig” and a “feature quality one” gave me troubles. Later I realized that it's better to start small. 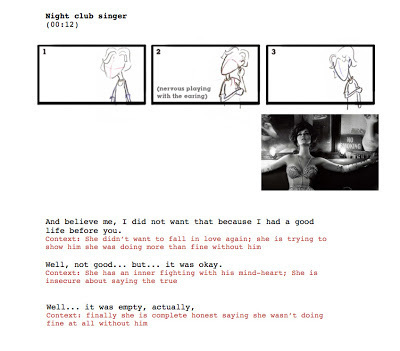 Can you talk a little about your process of your dialogue test, "Night Club Singer?" From coming up with the background story, your video reference, to splining? First, I wanted to thank my instructor Bobby Huth for his awesome class and critiques. From the first moment I wanted to do something completely different from last term, so I started looking for audio clips with a male and female voice on it. Since I'd never done any girl acting before, I decided to animate that type of character. One thing I always had in mind was that “I wouldn’t make the same mistakes from last term.” So, from the beginning I started to plan it out, listening to the audio clips around a hundred times. I remembered Jeff Gabor saying to me in one of the General Review classes, that he recommend memorizing the dialogue before jumping in front of the camera. That was a key thing because I had little acting experience and memorizing the script was the first thing we would do before starting a performance or creating any character. So with that in mind, I started recording a lot of video reference, around 100 movie clips or more. After that, I wanted to give it a kind of vintage girl look. In the blocking process I started posing and tried to lock down emotions and expressions, then tried to refine the poses. I used Dave Gallagher iteration advice and kept working with that in the blocking, plus I added more mouth shapes. Once I had my blocking approved, I started splining. Trying to keep things tight, holding poses to avoid that “bad spliney look.” Really focusing on eyes, I watched Garrett and Tyler's videos about eyes and blinking and just kept going with the polishing. How has your experience been at AnimSchool? What's your favorite thing you've learned? My experience here has been fantastic. I don't have enough words to say to thank the school’s staff and my wife, who have supported me from the beginning. I've learned thousands of things here, but one of the most important things was to realize that not every shot was a “reel one.” Many of them have a learning purpose. For example, I remember when I was in Anthea's class 2 and I was pretty happy with my walking assignment, but she made me think that a shot needs more than animation to make it look good. You need to entertain the audience, so that was an epiphany for me. Since then, I always think about the type of story that can entertain the audience, and of course myself. Also, the Mike Mattesi's drawing classes help me a lot at the moment with posing. Student Camilo Guaman - Class 6 Facial Performance from AnimSchool on Vimeo. What advice would you give other students that are just starting out at AnimSchool? Never compare your work with other students! The only person you should be comparing to is yourself. In this type of environment full of people from different backgrounds and experience, it's easy to get shocked by other people’s work. Try to learn from your mistakes and don’t make them again. Sounds pretty obvious, but I always have to remind myself of that. Also, try to find simple and interesting ideas for your assignments in order to always be motivated. AnimSchool Instructor and DreamWorks Animator, JP Sans, reviews AnimSchool student Min Hong's dialogue test from his Character Performance class. In this review, JP describes how to use the cheeks to help amplify a dialogue test. 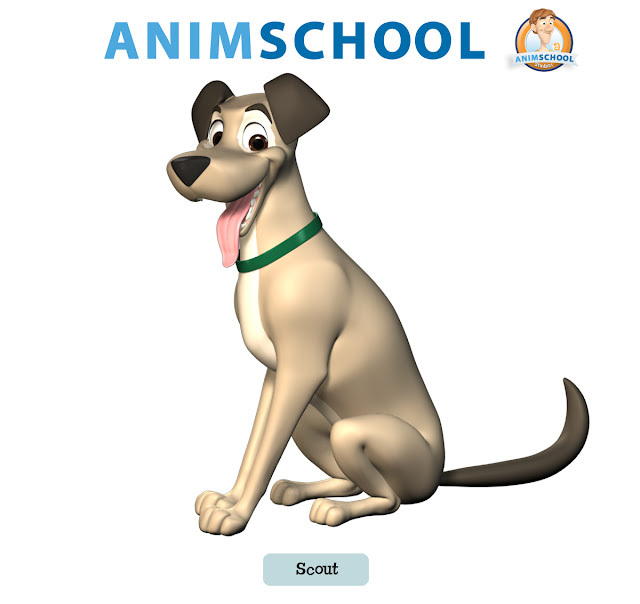 Orem, UT United States - February 4, 2013 -- Animschool announces today their new dog character, Scout. Scout is a fully articulated character rig, designed for demanding action or acting needs. Scout's face is exquisitely developed to reach extreme poses and maintain maximum appeal. "Appeal and hyper-expression are our driving passions and why people are drawn to AnimSchool," founder Dave Gallagher said. The Scout character has been painstakingly developed to reach artfully designed poses, and allow for a myriad of variations in expression. "That kind of quality and attention to detail are a part of everything we do at AnimSchool. It's what sets us apart and gives our students the edge when it comes to appeal and entertainment." AnimSchool characters are used by more than 10,000 users worldwide, and have been used to win numerous animation contests and for commercial needs. AnimSchool is known as the most trusted name for appealing 3D characters. AnimSchool animation students use these film quality characters to learn 3D animation, making their animation work stand out among competitors. AnimSchool Character program students learn the secrets of appealing character creation. Scout is the result of months of research and development. Said Dave Gallagher, lead rigger "So much passion and loving care went into making this character. It seems like each part was made, changed, then remade again to be more appealing. Realizing 3D characters that live up to beauty of 2D designs is a real challenge. It is truly a labor of love." AnimSchool students are able to use Scout for their animation assignments. AnimSchool Character students can use Scout to learn the arts of high-end modeling and rigging. 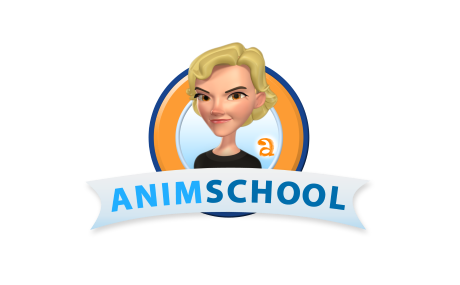 Now with 180 students, AnimSchool was founded in 2010 to bring character-focused 3D animation instruction to students all around the world through live online sessions with the very best film professionals.